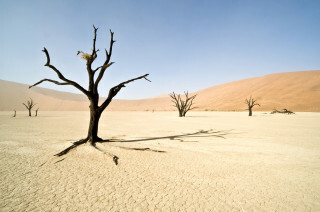 Deadvlei in Namibia is one of the strangest places we have ever visited. The parched clay soil is cracked like crazy paving and the dune surrounded area is populated by nothing but the black skeletons of dead and ancient trees. Long shadows are cast across the table flat surface as the early morning sun prepares itself to bake the surface even further. The area was once irrigated by floods from the Tsauchab River and pools of water would form which supplied the Camel Thorn Trees with essential life giving moisture and nutrients. As the climate changed the huge dunes began to encroach and the river supply was cut of leaving the clay pan in a state of drought and the trees perished. The dry conditions prevent the trees from decomposing and these strange skeletal remnants are estimated to be a staggering 900 years old.